What is the difference between full tort and limited tort? Which option should I select? What deductibles are available for comprehensive and collision? Should I select higher deductibles? Should I drop comprehensive or collision coverage on an older vehicle? What limits of liability are adequate? Should I purchase a personal liability umbrella policy? Uninsured/Underinsured motorist coverage? What is covered and what limits should I choose? The loan on my vehicle has been paid off. Why does the loss payee name still show on my policy? What is the mature driver improvement course and how do I qualify? I have a youthful driver to add to my policy in the near future. What should I consider? I have a student away at school. How will this affect my auto insurance? How should I handle the reporting of auto insurance claims? I am renting a vehicle on vacation in the US or Canada. What coverage do I need to purchase from the rental car company? I am renting a vehicle on a vacation in Europe or Mexico. Do I need special coverage? Property values and construction costs have increased in the past few years. How do I know if the coverage amount under my homeowner’s policy is adequate? What limit of coverage should I maintain for personal liability? I have jewelry and other valuable items. How should they be insured under my policy? I have a finished basement with a sump pump. Will my policy respond to damage if the sump pump malfunctions or overflows? What does a flood insurance policy cover? I run a business from my home. What coverage do I need? How much can I save if my homeowner’s and auto insurance are combined with one company? What discounts or credits apply for protective devices and alarms? What coverage is available under the homeowner’s policy for identity theft? If I pay off my mortgage, refinance or pay off a home equity loan, who do l need to notify? What coverage do I need if I rent a home or apartment? What kind of health insurance coverage is available? I am interested in life insurance. How do I determine the amount and kind? Since 1990 Pennsylvania law allows you to choose tort options. Full tort does not limit your right to sue. Under limited tort you are giving up the right to sue for non-economic damages most commonly known as “pain and suffering” except in the cases of serious injury. The law defines serious injury as death, serious impairment of bodily function or permanent serious disfigurement. If your injury is determined to be serious you will keep your right to sue for non-economic damages even if you have elected limited tort. This selection will be effective whether you are going after the responsible driver’s insurance company or if you are filing the claim with your own insurance under an uninsured or underinsured motorist claim. There is also an exception that allows for non-economic damages if the responsible driver is convicted of or accepts ARD for driving under the influence of alcohol or a controlled substance, or if the responsible driver’s vehicle is registered in another state. Several years ago the differential for tort options was changed. Depending on the coverages you select, the additional cost for the full tort option will range from 20-40%. Damage to your vehicle is covered subject to a deductible. You can select deductibles for comprehensive and collision coverage. Collision coverage responds when you collide with an object or vehicle other than an animal. Comprehensive coverage responds for animal collision and other types of damage including theft, vandalism, and glass breakage. Deductibles are available as low as $50 or $100 for some coverages. Higher deductibles are also available such as $500, $1,000, $2,000 or more. Over a number of years, if you don’t cause an accident, the savings may be much more than the deductible exposure. Depending on the age and value of your vehicle, it may be time to consider dropping comprehensive or collision coverage. If you can absorb the financial loss, you can save the premium costs of these coverages. Bodily injury damages in auto accidents are driven by medical costs. Medical costs have skyrocketed. Those who are seriously injured seek damages in multiples of medical expenses incurred. $100,000 or $300,000 are not large amounts of money in this context. Consider bodily injury liability limits of $300,000, $500,000, or more and consider a personal liability umbrella with limits of $1,000,000 or more to provide additional coverage. You probably should consider purchasing a personal liability umbrella policy with a limit of $1,000,000 or more. Personal umbrella policies will pay beyond your underlying policy limits for personal liability and auto liability exposures. Umbrella policies include coverage for personal injury which covers exposures such as libel, slander, defamation of character, wrongful eviction or malicious prosecution. Most umbrellas provide worldwide coverage and the umbrella policy covers costs of defense in addition to the limit of liability you have selected. The cost for a personal liability umbrella depends on the number of vehicles, drivers, boats, recreational vehicles, etc. A policy with a $1,000,000 limit generally costs between $200 and $400 per year, depending on the exposures. Additional layers of coverage are less expense. Uninsured and under-insured motorist coverage provides coverage for you and members of your family if you are injured in an accident caused by someone else without insurance or with low limits of insurance coverage. You can recover under uninsured and underinsured motorist coverage for any type of damages that you could recover from the insured driver. This includes economic and non-economic loss. Your uninsured and underinsured motorist coverage is linked somewhat to your tort selection. Uninsured and underinsured motorist coverage is not required in Pennsylvania. You can purchase coverage equal to your bodily injury liability limits. Coverage can be stacked or you can reject the stacking of coverage. If coverage is stacked, the limits are multiplied times the number of vehicles on the policy. The higher stacked limit is available per accident. Premiums are higher for stacked coverage than they are for non-stacked coverage. You should select limits and stacking based on your coverage needs and costs. If your vehicle has a loan or is leased, the financial organization making the lease or loan requires that their organization is included as a loss payee under your policy. If you have an accident, their name goes on the check along with yours. When the loan is paid, you should notify your agent to remove the interest of the loss payee. In most cases, the financial organization does not notify the insurance company or agent. Pennsylvania law provides a 5% discount for drivers 55 and older who successfully complete a mature driver improvement course approved by PENN DOT. All drivers on the policy who are age 55 or older must have completed the course in order for the reduction to be granted. A certificate is provided by the course provider and must be provided to the insurance agency. You pay a substantial additional premium for youthful drivers on your auto policy. Discounts apply for good students and driver training programs. Provide the proper documentation to your insurance agent. When you add a new driver, you can save the costs for comprehensive and collision if that driver is rated to an older and lower value vehicle. If you do maintain full coverage on the vehicle to which the youthful driver is assigned, consider higher deductibles for that vehicle or higher deductibles for all vehicles on your policy. Renewal of your policy can be refused if there are two accidents in a three-year period. It is a good idea, especially in the case of youthful drivers, to keep minor accidents off your record. If a student is away at school without a vehicle and the school is located 100 miles or more from home, most companies provide a substantially lower rate. If the student is away at school with a vehicle, a lower rate may be available if the insurance company agrees to garage the vehicle at school and if the rating territory of the school location provides for a lower cost. In many cases, you should report auto insurance claims promptly to the agency. Some carriers require or prefer that claims be reported directly to the insurance company. They provide 800 numbers which claim 24-hour service in reporting claims. Most insurance company claim departments are not open on evenings or weekends and claim reporting is outsourced to firms that do not know anything about your policy or coverage. For claims that do not involve injuries, you may decide to pursue a claim through your insurance company or through the insurance company of the responsible driver. If your deductible is substantial, the latter approach may be more satisfying. If you have already had an accident under your policy and you report a second accident which is minor you may jeopardize the renewal of your coverage. Agency personnel are available to return calls to you with questions about accidents that occur after hours. Whether you report the claim directly to the company or to the agency, you can make a phone call to the agency at any time if you are not sure how you want to handle a claim. If you have a vehicle insured under your personal auto policy with comprehensive and collision, generally speaking, physical damage to a rented vehicle which is a private passenger vehicle, pick up or van extends to the rented vehicle with the same deductibles. Unfortunately, the rental car contract may make you responsible for more than what is covered by your policy. For accidents that involve substantial damage, some rental car companies can make a charge for diminished value. Theycan also charge more for loss of use than the amount that would be covered by your policy. Some rental car companies will charge the full value of the vehicle to your credit card until your insurance company settles the claim. Depending on the cost of purchasing collision damage waiver from the rental company and the length of your rental and any details of your travel, you may want to consider purchasing the collision damage waiver to reduce or eliminate these exposures. Generally speaking, the personal auto policy does not provide coverage for vehicles rented outside the United States and Canada. A personal liability umbrella policy may provide worldwide liability coverage but will not cover physical damage to the rented vehicle. You may need to purchase both liability and physical damage coverage for rentals outside the United States and Canada. You should insure your home for full replacement cost of the structure. Construction costs have increased dramatically in this decade. Your home should be evaluated and any improvements you have made should be considered. Some policies provide a dwelling replacement extension of 20-50% above the dwelling limits shown on the policy. You should insure for 100 % of the dwelling replacement cost and include the extension endorsement to provide extra protection. The homeowner’s policy generally provides limited coverage for certain classes of personal property. These classes include cash, coins, jewelry, furs, fire arms, silverware, and business property. Limits may apply for other classes. In some cases the limits apply only for theft and in other cases limits apply for all causes of loss. Endorsements or policies are available to provide blanket or scheduled coverage for valuable items that are not properly covered under the regular homeowner’s coverage form. Many homeowners’ policies exclude water damage for water or waterborne material that backs up through sewers or drains or overflows or is discharged from a sump pump or related equipment. Flood, ground, or surface water are also excluded. A separate endorsement is available to provide coverage for water back-up of sewers and drains and sump pump malfunction or overflow. Homes with a sump pump and finished basement are most susceptible to these losses. Many companies offer this coverage with a limit of $5,000 to $10,000 per loss. A few companies offer this coverage without limits. Annual costs range from $25 to $75. Water back-up and sump overflow coverage will not help if ground or surface water rising on all sides of the building causes water damage to your basement or a section of your home built over a crawl space or on a slab. Flood coverage can and should be purchased to cover this exposure. Homes outside of a normal flood plain area can purchase a preferred flood policy with low premiums to provide coverage for this exposure. Current flood policies still provide limited coverage for finished building components and contents below ground level. Many flood losses occur outside identified flood plain areas. You should understand coverage limitations but consider purchasing flood insurance coverage even if your mortgage company does not require it. Homeowner’s policies provide limited or no coverage for a business conducted in your home or in a detached structure at your home location. Endorsements are available to expand coverage and you may need a separate policy to provide the proper coverage. Assume you have no coverage. Ask questions and evaluate your options to cover your home-based business. Substantial discounts are available to combine auto, home, and other personal lines policies with one company. Savings are as much as 20%. Home policies provide rate credits for smoke alarms, deadbolt locks, fire extinguishers, central station monitored burglar and fire alarms, and sprinkler systems. Make sure your agent or company are giving you the proper credits. Identity theft coverage can be added to the homeowner’s policy to cover the cost associated with clearing your record. Limits available range from $2,500 to $25,000 at annual costs from $10 to $35. In the past few years there has been a flurry of refinance activity. Home equity loans and home equity lines of credit are very popular. If you pay off a mortgage or take a new loan, the interest of the financial organization must be added or deleted. The insurance company or agent is often not notified when a loan obligation is satisfied. Communicate any changes to your agent, review your renewal policy, and make sure interests listed are correct. Renters need coverage for their personal property and they should choose to provide coverage based on replacement cost. They also need coverage for additional living expense in case they need to live somewhere else temporarily after a fire or other covered loss. Renters also need personal liability insurance coverage. Renters should not expect that any coverage is provided for their personal property or personal liability exposures under the landlord’s insurance. Because renters are not paying a premium to insure the building, coverage is generally very inexpensive. Golden Rule (a United Healthcare company) and Assurant Health (Time Insurance). Additional options may be available for the self-employed. Short term medical coverage may serve the needs of those who need coverage for a limited period of time. Check out resources listed on our health insurance menu. These include rates, applications, online quoting and online applications. Stated simply, the amount of life insurance needed depends on your income and your financial responsibilities to your dependents. The amount can be determined by considering the amount that would be required for final expenses, mortgage and debts, education costs, family income and taxes and estate costs. In the process, you would consider Social Security benefits available and other financial resources are quoted at 5-10 times your income. Some situations can require substantially more coverage than these ‘Rules of Thumb”. Insurance needs calculators are available to assist you. 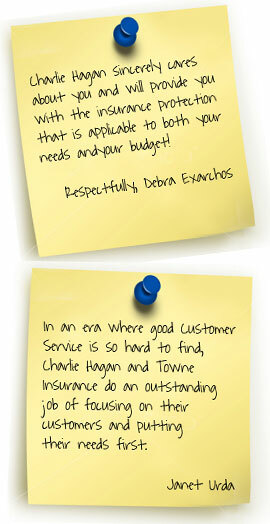 Hagan’s Towne Insurance Associates, Inc. personnel can also help. One kind of life insurance that is simple and inexpensive is term life insurance. Term life insurance plans are available with level premium periods of 10, 15, 20, 25 and 30 years. Personal health history, family history and tobacco use will affect the cost of coverage. You can run online term life insurance quotes from the resources available on our life insurance menu. Permanent insurance plans are also available with lifetime coverage and level premiums.